You may remember that for Lily's 5th birthday on March 16 this year, my mom and I donated 5 comfort boxes to the hospital where she was born <--- click on link to read more about that. I had been working on the boxes for a loong time and knew it was time to finally take them. I see now how it was all in the Lord's perfect timing (as things always are). Part of the reason why I hadn't taken the boxes yet was because it was nerve-wracking to think of going back to the place where Lily was born, the place that holds many painful memories for my family. Also, I didn't even know how to go about donating the boxes, who to contact and what not. How it happened was I talked with my friend Bonnie who leads the Covered in Love infant loss support group I go to, and donates blankets to the same hospital where Lily was born, to be given to families experiencing the loss of a baby. I asked who she is in contact with at the hospital to do that and she put me in touch with a lovely nurse named Sandra who is involved with bereavement care at the hospital. I texted Sandra several weeks before Lily's birthday and asked if donating the boxes was something I could do. She was so kind and compassionate from the first text message she sent me and made me feel like they would greatly appreciate the boxes. So, I got the approval for each item I selected and sent her photos and an explanation for why I was including each thing I chose. She set up a meeting in a conference room for my mom, sister-in-law, and I to bring the boxes on Lily's birthday. I wanted to go on that specific day, which made it that much more special, but of course also meant it was that much more emotional. 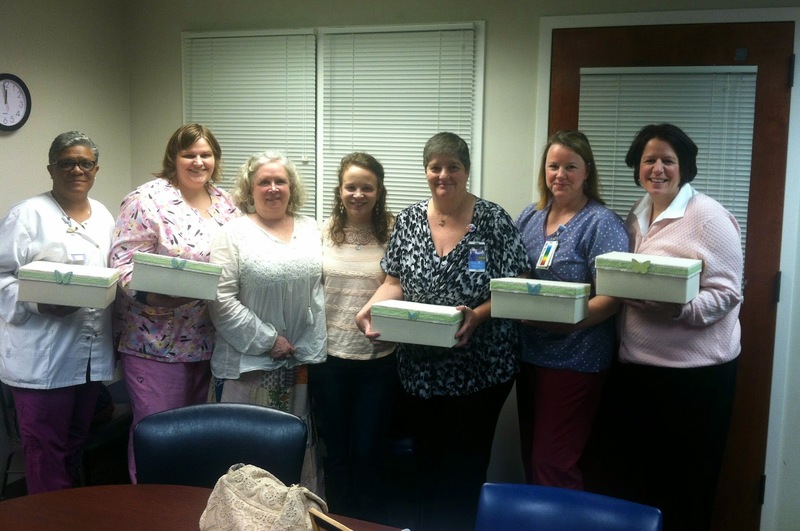 I wasn't expecting there to be several nurses in the room waiting for me to share my boxes with them. What an honor that was and how special it made Lily's day. My mom and I were also able to share about our experience at the hospital when Lily was born there. And we were able to visit the room where Lily was born since nobody was in there at that time, which was extremely healing for me. Since I took the boxes, God has opened up more doors for me to get involved in the perinatal bereavement program at the hospital. I think that before this time on my road of healing, I wouldn't have been emotionally ready to be involved in this program, nor would I have the desire to go back to that hospital regularly. It would have been too painful and draining. But God knew when I would be ready and had it all planned out for how I'd get in contact with Sandra through Bonnie and have these doors opened up. He had it all in the palm of His hands. Sandra contacted me earlier in the summer and asked if I'd like to come to the bereavement committee's monthly meeting at the beginning of August. We had discussed me getting involved more when I went on Lily's birthday. I of course was honored that she would ask and eager to go. The meeting was last Monday morning. I ended up being at the hospital for 4 hours! The meeting was held in the same conference room that we were in on Lily's birthday. It was nice to see Sandra again, as well as other nurses that were there on March 16th. Sandra asked if I knew a lady named Heather, who is a local loss mom. I told her that yes, I did! It was neat to see my friend there that I wasn't expecting to see. I've known Heather since I first started attending one of my local infant loss support groups, just a couple months after Lily was born and died. Heather's daughter, Addison, would be turning 6 next month, so she was born about half a year before Lily. It's hard to believe they would both be starting Kindergarten this year. :-( I've been to visit Addison's spot a few times. It is only about 20-25 minutes from my house. It was so interesting that this was the first meeting Heather had been to, which "just so happened" to be the first official meeting I went to. We both agree that it was in the timing it was meant to be. I am impressed with the staff of nurses at the hospital. They are genuinely concerned about caring for their patients experiencing the loss of a baby in the best way possible. They want to know what they can change to better and more sensitively care for their patients emotional and physical needs. Heather and I were able to share our own experiences of delivering at the hospital, what we appreciated, what we wish could have been different, and so forth. They were going over the policy on caring for patients and we shared so much of our hearts and experiences. It meant a lot to me to feel heard and like my birth is validated and important. 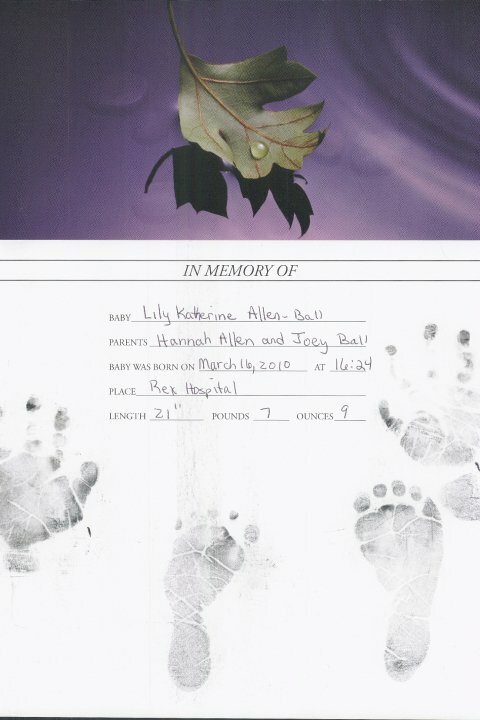 A couple things we discussed were the importance of taking photos, and gathering keepsake items, such as taking baby's handprints along with footprints as standard protocol (instead of only footprints. I had to ask for Lily's handprints and don't even know now why I did, but of course am so glad I did. I believe it was the Lord's leading). The hospital is also creating a beautiful memorial garden and is doing a year-long follow-up program for those who've lost a baby, which is amazing! Instead of going home and being forgotten (or at least feeling that you are), the families will be receiving calls, cards, etc. to let them know their baby is remembered and they are cared about! We were taken upstairs with a couple nurses after the meeting concluded and were able to see the supply room where they keep the bereavement items. I saw one of my boxes in there (the last one). Anyways, the highlight of the whole meeting for me was hearing how my mom and I sharing our experience with Lily is changing things at the hospital. We (all of us) can make a difference in this world, even in small ways. There is a common symbol that is used by hospitals across the country to alert medical professionals that someone in that room has had a loss. 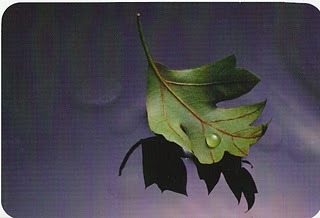 It's a dreadful leaf with a teardrop on it. I think it is important that staff doesn't come waltzing in the room to ask how the baby is when the baby won't be going home. But, that symbol is just so sad and depressing. Yes, it is a sad thing when a baby dies, but it is also an incredible thing that the baby first LIVED and birth is still beautiful. My mom said when she first saw that leaf on my door when I was in labor she wanted to rip it down. Not only is the logo changing, but the butterfly will be a new theme, like I used in my comfort boxes. One of the nurses found a butterfly necklace with a pearl for the parents. I'm looking forward to getting more involved and seeing what God has in store! *Update: To see the final new logo, click HERE.